Sagaba Konate or Jevon Carter: Who is West Virginia’s MVP? After 18 games, Jevon Carter has garnered the lion’s share of national media attention, but Sagaba Konate’s ascension has been epic in scale. Who means more to this team now in the thick of Big 12 play? West Virginia basketball. Truthfully, I’d rather be thinking about anything else right now, given last night’s epic meltdown against Kansas. Nothing hurts more than giving one away at home against the league’s de facto top dog, especially when West Virginia at one point held a 16 point lead. But, life goes on and today the sun did rise. If nothing else, writing this is an exercise in healing and, perhaps, we can heal together. When you look at the season as it stands now 18 games in, the Mountaineers have been incredibly successful. Yes, the losses hurt, but, when you consider that Huggins’ group have lost to two top-10 teams by a combined six points, the scene is not nearly as desolate as it might feel. As far as national attention is concerned, senior PG Jevon Carter has been at the center of everything. No one in the nation can play man defense on a nightly basis with such ferocity and with the level of aggression that the Illinois native displays. Even when his offense inexplicably dries up (and it has), he’s consistently spearheading the relentless full-court attack that West Virginia has effectively placed a copyright on. Conversely, sophomore forward Sagaba Konate is coming off a promising freshman season where he he showed some legitimate flashes but also demonstrated a lot of room for improvement. At this point in the season, it’s safe to say that Konate has not only improved but has blasted a hole in the ceiling and flown through it. In the last three games alone, Konate has tallied 12 blocks, 33 rebounds and 31 points. His multiple entries on the Sportscenter top-10 reel aside, Konate has very quickly and very emphatically made a name for himself on a national scale. So, the question is this- who, up to this point in the season, has been more crucial to West Virginia’s success? The popular vote, if one was tallied right now, would probably go to Carter based on his resume from the last three seasons along with the impressive year he’s currently having. However, Konate is an irreplaceable fixture in a front court critically lacking depth. How does one make a determination between two players who are so drastically different in nearly every measurable aspect? I’ll try my best to make a reasonable case for either player. The argument for Jevon Carter is pretty clean cut. Now in his fourth season, Carter is essentially a founding father of the “Press Virginia” era in Morgantown. No one on the team, aside from fellow front court P.I.C. Daxter Miles, has seen more battles and fought for more wins than the Maywood, IL native. Simultaneously, Carter has the hardware to warrant distinction at the highest level including three consecutive years on the Big 12 All-Defensive team, the 2017 Big 12 defensive POTY award and the Lefty Driesell defensive POTY award. So far in the 2018 campaign, Jevon Carter has continued to elevate his game to help push West Virginia to a 15-3 mark and a top-10 ranking. Additionally, Carter is leading the team in five statistical categories including points (16.7), assists (6.3), FG% (41.2), FT% (84.3) and steals (3.4). To say he’s integral in the Mountaineers pursuit of a first-ever Big 12 title is like saying that stallions need room to run. It’s a rare moment when Carter is not on the floor given that he’s averaging 34.6 minutes per game this season and, honestly, when he is spelled it has more to do with foul trouble than a spent gas tank. Simply put, Carter’s energy reserve is seemingly infinite and the bar he sets for the rest of the team is nothing if not stratospheric. With regard to Konate, the argument is colored a bit differently. A native of Mali, Konate comes from good basketball pedigree as his older brother, Bakary, was a scholarship player at Minnesota. After a promising freshman year, there was skepticism surrounding West Virginia’s front court coming into the 2017-2018 season due to Elijah Macon announcing his intent to move on to the pro level and senior forward Brandown Watkins graduating. Only a sophomore, Sagaba Konate doesn’t seem to be shrinking from the spotlight, nor does he seem to be overwhelmed by the sizable hole left in the Mountaineers front court. Sags exudes a presence on the low block that is akin to an angry bull mastiff guarding the door to his family home. Ask Kansas what it’s like to try and score near the rim while he’s in the game, they’re not like to paint a very pretty picture. Ask ESPN who the nation’s new favorite shot blocker is. Ask anyone across the West Virginia fan base if Devin Williams or Elijah Macon are still sorely missed. I believe you already know the answer to each scenario I’ve laid out. In addition, Konate’s current per game averages in for points, rebounds and blocks (9.3, 7.9 and 3.1) far exceed his 2016-17 marks of (4.5, 2.9 and 1.4). While Sags doesn’t possess the motor of his guard counterparts, he gets more out of his 23.8 minutes per game than anyone on the team and, perhaps, anyone in the conference. Konate’s presence under the basket has become such that there is psychological dynamic opposing teams have to consider. The shadow he casts in the paint forces opposing players to routinely second guess driving to the basket in a way that few, if any, forwards in the Big 12 can. Perhaps the biggest differentiator between what Carter and Konate contribute to West Virginia’s success has less to do with their own individual abilities and more to do with overall roster depth. It’s no secret that West Virginia boasts talented guard play. Aside from Carter, Daxter Miles, Beetle Bolden and Chase Harler are all key contributors on the perimeter. In addition, Esa Ahmed, Lamont West and new crowd favorite Teddy Allen are all swingmen/flex forwards who have the ability to score and capably run the floor. When Carter does need a spell, Bolden has shown to have the lightning-quick feet and scoring ability to be more than serviceable in filling in. Not to mention, hyped signee Brandon Knapper, who has been practicing for several weeks now, has yet to even log in-game minutes and is just waiting in the wings to potentially contribute whenever is number is called. It’s in the front court where the herd thins considerably. Behind Konate, sophomore Maciej Bender has been the alternate big man who has played substantial minutes. If you follow me on social media, you may have observed me giving Bender less than glowing reviews. While his effort is apparent and I’m sure the work he is putting in behind the scenes is commendable, Bender is simply a massive step down in talent from Konate and it shows. Whether it’s rebounding on either end or getting into position to score in West Virginia’s motion offense, the minutes that Konate is away from the line up look considerably different than when he’s in it, specifically because the paint is far more susceptible to enemy advances. Behind Bender, 6’11” freshman Logan Routt is available but his minutes, along with his contributions, are scant to none. To no fault of his own, Routt is a project and will need another season or so to start coming into his own and finding his place in this Press Virginia world that he inhabits. This, in my opinion, is where the scales tip ever so slightly in favor or Konate over Carter. Crazy as it sounds, Carter, the veteran of so many battles, benefits from a far thicker cushion of supporting talent than Konate does. To put it into broader terms, if Carter were to get pulled from the game or (god forbid) injured, the team can function at the relatively same level with with the combined efforts of Bolden, Harler, Allen et al. Remove Konate from the line up for any considerable stretch of time and West Virginia’s ability to both score and defend inside the paint becomes a dicey proposition at best. When you look ahead at West Virginia’s remaining schedule, there is no off day. Two of the Mountaineers’ next four opponents are ranked in the top 25 and they’ll be on the road facing TCU. Kentucky comes to Morgantown next Monday. Road rematches with Kansas and Oklahoma still loom. The margin for error, from now until tournament time, is essentially non-existent. That is to say that every player on this roster is invaluable and depth at every position is absolutely critical. Jevon Carter is a born leader and commands respect from both friend and foe like no other player in the West Virginia locker room. By the time his playing career in Morgantown comes to a close, it’ll be hard to argue against his place among the finest defensive players to ever wear the blue and gold. But viewed in a vacuum, where we are only concerned with this season, both the games that have been played the remainder of the schedule looming ahead, one could very easily argue that West Virginia would be facing far worse odds should Konate suddenly become absent from the line up rather than Carter. I, for one, can’t think of a better litmus test for measuring the value of an individual player. It’s certainly a divisive argument and one that national media would likely disagree with, but from my vantage point during the last 18 games, Konate’s rise and towering presence in the front court has not only been meteoric, it’s the first time since D’or Fischer guarded the paint for John Beilein’s tournament team nearly 13 years ago that West Virginia has had a legitimate shot-blocking force in the paint. 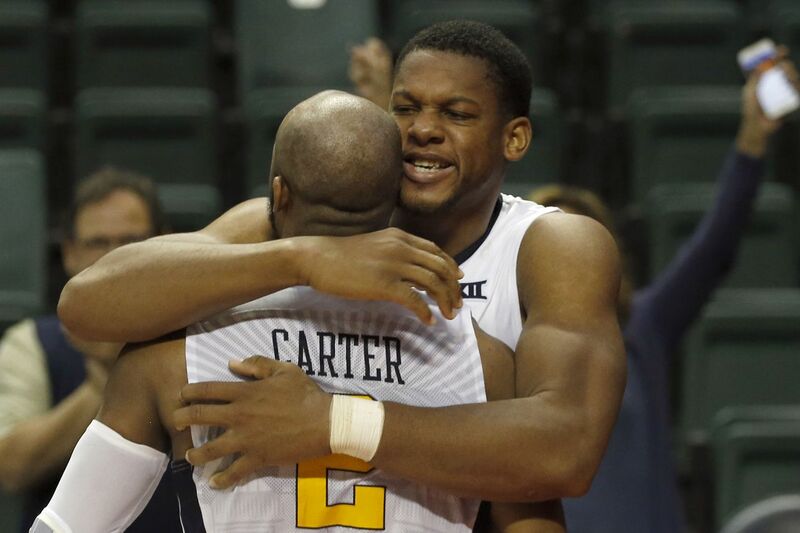 Either way you split it, Carter and Konate are mandatory elements for West Virginia’s good fortunes moving forward. While Carter is putting the finishing touches on a legendary Mountaineers career, Konate is only just finishing the first chapter in his own anthology. With so much basketball remaining, the narrative could look entirely different by the time we reach March and knowing how treacherous the Big 12 landscape is this year, I’d be shocked if it didn’t. Rewards, recognition and accolades aside, I just want this team to win, regardless of who has more stars next to their name. Wins are more valuable than anything else could ever be, anyway.